Tag line: "Film Was Born of an Explosive"
It is estimated that 75% of all silent films - most printed on highly flammable nitrate stock - have been lost. We learn this little factoid early on in writer / director Bill Morrison’s 2016 documentary Dawson City: Frozen Time, which makes everything that follows it all the more incredible. Founded in 1897, Dawson City, a tiny metropolis situated in Canada’s Yukon Territory, saw its population explode during the Klondike Gold Rush of the late 19th century (at its height, 40,000 people called Dawson City their home). As a result, the town grew very quickly, with saloons, gambling houses, brothels and even a few theaters popping up. In the first decades of the 20th century, moving pictures were all the rage, and several venues in Dawson City exhibited them on a regular basis. Because the town was so far north, it sometimes took two or three years for Hollywood’s newest releases to reach it. In many cases, the residents of this Yukon community were the last to receive the prints, and since they were, at that point, considered “outdated”, the studios and distributors didn’t want to pay for their return. So, once they finished their theatrical run, the film reels were crated up and stored in the basement of a burned-out library. Within 10 years or so, this basement was filled to capacity, and a bank manager (whose facility was hired by the distributors to ensure the movies didn’t play past their rental period) again asked the powers-that-be in Hollywood if they wanted their films back. They didn’t, but instead of destroying the reels (as the studios instructed him to do), the banker donated the crates to a local hockey team, which used them as landfill for the construction of a new ice rink. The building that surrounded the rink eventually burned to the ground, and the crates stayed buried under the ice until 1970, when an excavation crew finally uncovered them. It proved to be quite a find: over 500 reels of nitrate films dating as far back as the mid 1910’s. The reels were then shipped off to a historical society, which cataloged each one, discovering some movies that were believed lost (and a few that most people had forgotten ever existed in the first place). 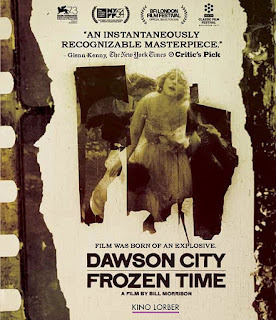 This story in and of itself is enough to make Dawson City: Frozen Time a worthwhile documentary, but it’s how director Morrison approaches the material that lifts this remarkable film to a whole new level. Instead of relying on narration and talking heads, Morrison lets the recovered movies speak for themselves, relating the history of Dawson City itself (recounted in great detail via newsreels and appropriate excerpts from dramatic films) as well as other historic events, like the 1914 Colorado miner’s strike; the end of World War I;, and the infamous 1919 World Series (see John Sayles’ Eight Men Out for more on this), footage of which was rescued from the Dawson City site. By dedicating so much time to the movies themselves, Dawson City: Frozen Time does more than relate the tale of an extraordinary cinematic discovery; it demonstrates what was gained by this endeavor, and what might have been lost had the reels remained buried forever. It’s because of this that Dawson City: Frozen Time is a documentary movie buffs and historians alike will stand up and applaud. The cache in Dawson City was a truly amazing find, and its story made for an equally amazing motion picture. I can not believe your so close to your goal!